Since transactions happen frequently in a restaurant business, the price fluctuations remains ignored while receiving the orders. If there is a large variance between the standard price for an item, then something might have gone wrong in costing your menu. This price variance may effect your business. 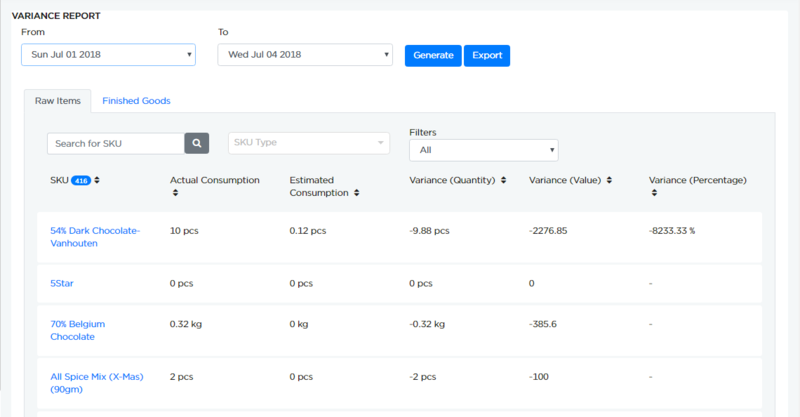 In this page, we calculate the variances between actual food costs and theoretical food costs based on your purchases, sales and stocktaking of items. It really helps you to track the price variance and also keeps the financial status healthy. Go to INSIGHTS -> STOCK VARIANCE to view stock variance. Inventory report for the selected date range can be viewed. You can click on the numbers highlighted in blue to check the sales and transfers made on that day. Consider, you need to view the transfer made on July 3rd for 54% Dark Chocolate- Vanhouten. As shown in above example, the moment you click on the number, it redirects to transfer page and displays the transfer done. You can click on the numbers highlighted in blue to check the stock balance,productions and transfers made on that day. Consider, you need to view the production made on July 2nd for Flourless Cake. As shown in above example, the moment you click on the number, it redirects to production page and displays the production done.